Well hello all of you lovely, inspirational folks! Let's just say I was blown away and beyond inspired by all of your awesome Pinterest-inspired projects from the summer Pinterest Challenge link party. I'm still trying to make my rounds to visit all of the linked projects (all 315+ of you! ), but you still have plenty of time to link up if you haven't already. I'll be featuring some of my favorite projects on my Facebook page and here on the ol' blog next week. So many great things to choose from! As we chatted about last week here, David and I have decided to do a mini-makeover of one of the rooms in our house before the bambino comes in early September. We affectionately call the room the "slate room," but it's basically a walled-in sun porch/ extra living room in our home. It's larger than our current living room, so there will be more space for baby and all of his toys. I posted more on our game plan (including a lay out for the new space) and before pictures of the room here. In the last week, we've made a little progress in the slate room that I'm excited to share! 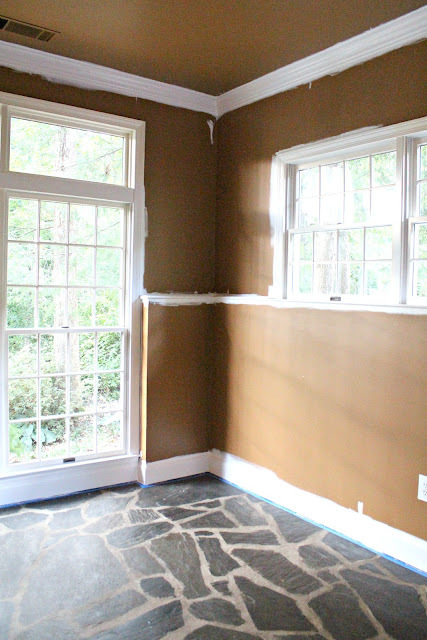 It may not look like much, but David has painted most of the trim in the room already! Ohhhhhh yeahhhh (please picture me saying that out loud in a Barry White voice). 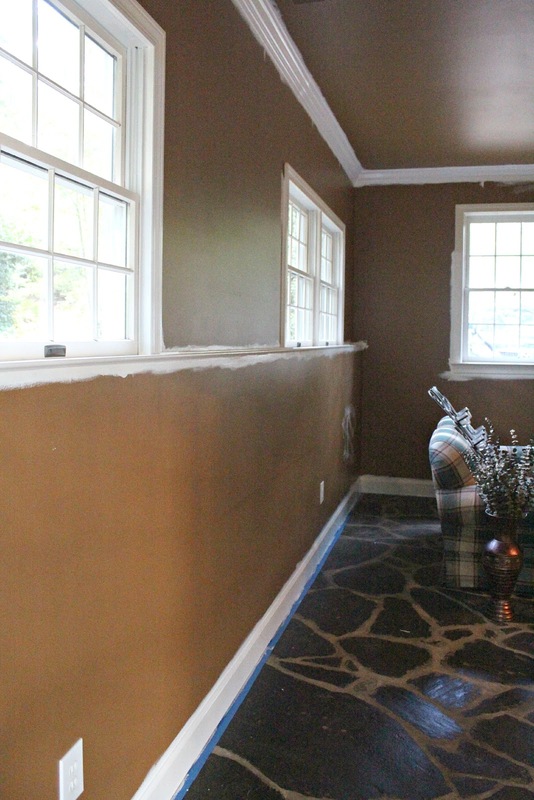 Much like the rest of our house, the trim in this room was painted a yucky, off-white beige. 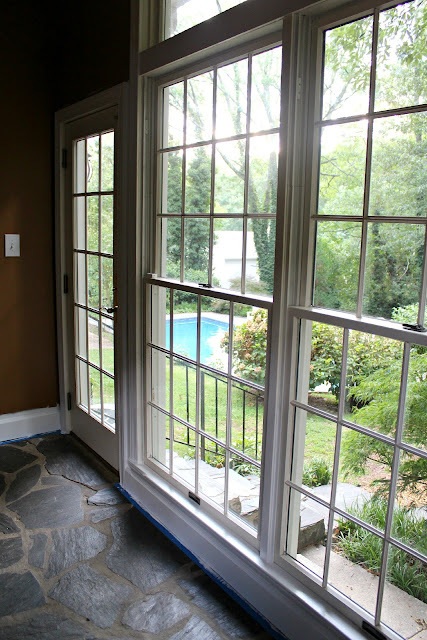 But we slapped a coat of bright white trim all up in that room (the same color we repainted the kitchen cabinets, the living room fireplace and trim and the plantation shutters in our house). It looks so good! We're sloppy trim painters, so we decided to paint the trim first and then clean it all up when we (well, David of course, not the preggo lady) paint the ceiling and walls. Many people prefer to paint the ceiling and walls first, then the trim... but it's all a matter of personal preference! This room screams "I'M GETTIN' THERE!" to me. I can't wait to hang out with my little bambino and stare at this view of our backyard with him! Also on the agenda is to pick another rug to go in the room. Our only parameters are that the rug has to work with the current rug we have in our living room (since we'll be moving it down here) and it has to be soft for baby to have some quality tummy time. That second qualification sadly rules out all jute rugs, which I think would actually be perfect otherwise. Y'all know I'm a huge fan of wool Pottery Barn rugs- we've got two in our house now with zero complaints. Our newest PB rug in the living room has held up fabulously, even with two big ol' messy dogs on them every day. So I ordered a couple of swatches of my favorite PB wool rugs to see how they worked. I honestly love them all. 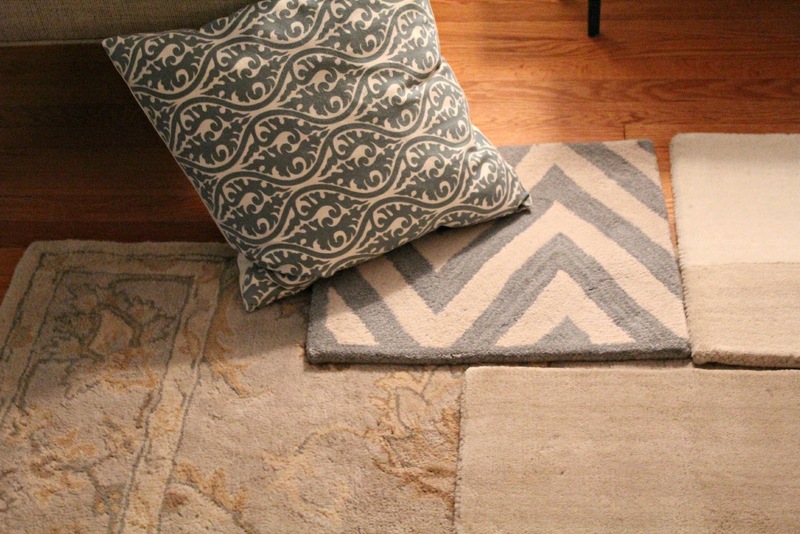 The gray with tassels has been on my radar for awhile- a perfect neutral rug. 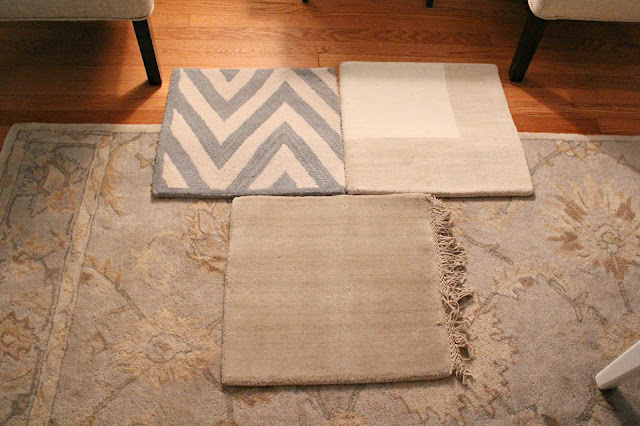 The blue chevron stripes would be so fun for baby, but I'm afraid it doesn't work with the current rug all that well. And finally, I think the two-toned ivory rug is absolutely perfect... but, um, it's ivory. I know I have a lot to learn about parenting, but I can't imagine that buying an ivory rug for a baby's play space is all that smart. I mean, it's kind of the color of spit up, right? They really could all work, to tell you the truth. I just keep leaning towards the ivory rug... we've treated our other wool rugs with stain blocker and, like I said, have never had any problems. Would I get the "world's stupidest parent" award if I go with the ivory? Which one of these do you like? Or we could go another route altogether... do any of you have any suggestions of wool rugs out there that would work in this space next to our current rug? I'd love to hear them! Here's where we are in our to-do list for the room. I think we're coming along nicely! 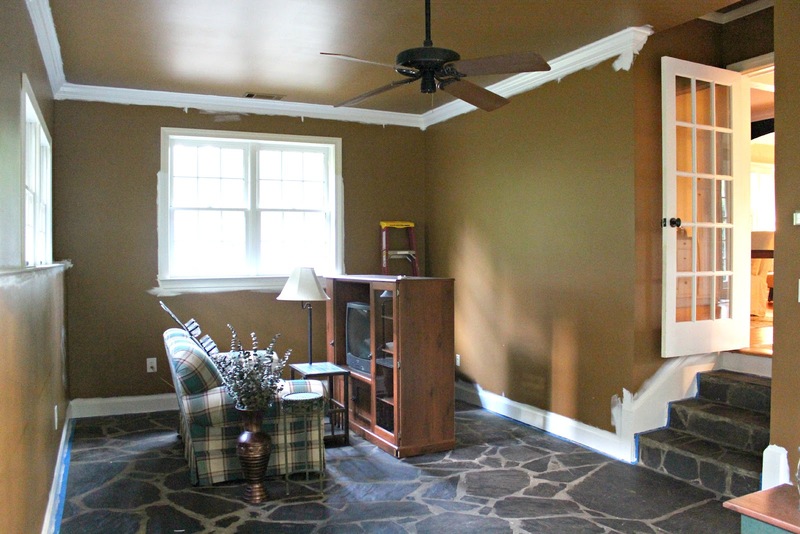 I always think a fresh coat of paint on trim makes a room look immediately cleaner/better. Yes, fresh white trim makes all the difference! Love all the choices. I personally have stayed away from light color flooring and wool rugs altogether. I just can't imagine dealing with the stains. I like them all! The blue chevron jumped out at me at first. I think that is so cute! But your right it doesn't exactly go with the current rug as well. I think the ivory is really pretty but it would be harder to keep clean with kids in the house, I have light carpet in my house and with three little boys in the house I wish I had something different. I think the cream carpet will be fine! I'm a mother of two (8 (boy) and 9.5 (messy girl)) and my house is 70% cream carpet and 95% clean. I received a lot of weird looks and opinions when we made the decision to purchase it, but I have no regrets. It's thick and comfortable and they love playing on it. You have some time before 'finger painting' time, so by then you'll have some ideas how to tackle those situations. I love Fantastik OxyPower followed by a vinegar and water (1:1) rinse. Good luck! It'll look great! This is going to look so fantastic! As a mom of 3 kids, I'd sy avoid ivory rugs! I love the gray choice. Can't wait to see the end result! I love the ivory, but I'd go with the gray... just sayin'! ;-) I love the blue chevron, too. Once all is said and done, it might work after all? Amazing what a coat of white paint can do, no? Yay for progress! The white trim looks great. We still have 75% of our house's trim to deal with, and ours is dark brown and uuuuuuug-lee. I've been putting it off. Anyway, can't wait to the after in your room! I kind of LOVE the chevron with the classic feel of your current rug. SO amazing!! I love the juxtaposition of old world vs. new world! :) Can't wait to see more! I actually own the ivory rug (in our master bedroom). I LOVE it because it's so soft underfoot, and such pretty colors. I'm also due in Sept but have two older kiddos (now 5 and 6), and after owning the rug for two years, it has a couple of spots on it but nothing too bad (but not a very high traffic area either). 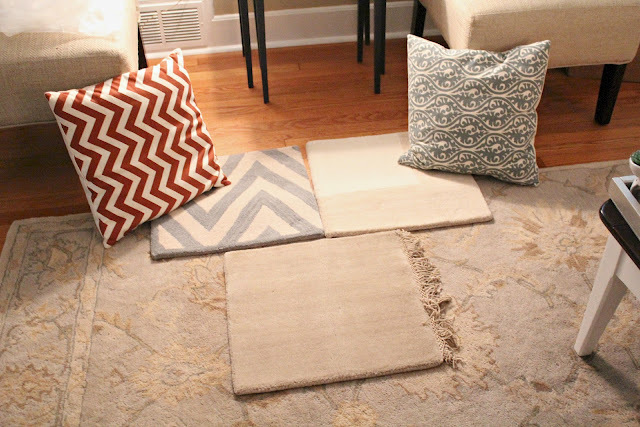 However, when our kids were younger (like 12-18 months) and held their own bottles/sippy cups, we had a similar beige-ivory toned color block rug in our family room which got absolutely DESTROYED from formula/milk drip stains. If you miss one little drip they leave stains that never come out! However, we didn't pre-treat that rug...so needless to say, it eventually looked horrible and we replaced it with a gray rug similar to the PB one you showed above, and haven't had any issues. The room is looking SO good. What a great apace, I'm actually pretty jealous. The white trim already makes such a difference. I'm the same way with trim. I prefer to paint the trim first because I'm an old pro at cutting in the walls. Can't wait to see how this room comes together. We just moved into a new place that has a brand new beige carpet in the living room. Somehow with all the moving and people walking all over it, it got a few spots. I discovered that baby wipes are the miracle spot remover. (We've got a 15 month old who has taken over.) So get the ivory rug if that's what you want - you'll have a ton of baby wipes to clean up any spots. The trim looks great! I just love bright white, it's so clean and crisp. 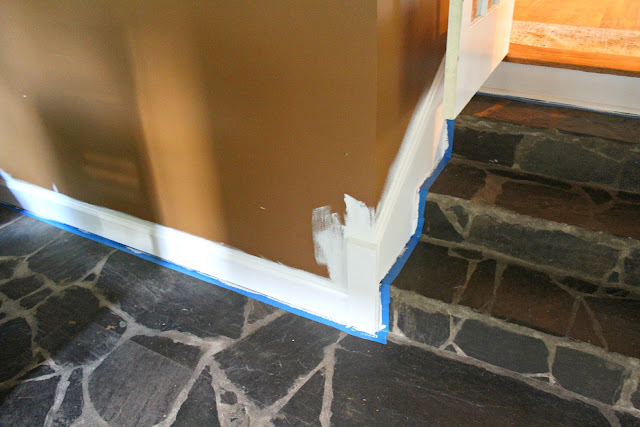 Painting the trim is on the to-do list at our house, but seeing yours makes me want to get it done ASAP! What color/brand did you use? Well...my first instinct is to say chevron because clearly I'm a fan. I think it could be so cute for a family/play area. But go with whatever the moms are telling you about easy clean up. The gray could be pretty, too! The white trim looks great already! I just found your blog through the Pinterest challenge and it's so cute. I'll definitely be checking it out way more often. I love the idea of the one with tassles because it looks like it would 'warm' the color of the slate up a little, but inside I really love the patterned one. I guess it would all depend on the rest of the colors/design for the room? Congrats on Bambino by the way! Love the bright white! It looks so good! Can't wait to watch this room transform! I'm a mommy to a 6-month-old and we have an ivory rug in our living room AND in her nursery. Absolutely no complaints whatsoever!! Can't wait to see that room painted, it'll be such a dramatic change! The room looks great. How far along are you? I am a Pottery Barn groupie and have both your living room rug (in my formal living room), their Kate rug (in my dining room) and now the chevron rug (in my family room). I LOOOOOOOOOVE all three rugs together, and I get tons of compliments on them. I think because they all have similar color tones they work together, though you can't see the chevron rug in the family room when you're in our formal living room, so maybe that would make a difference, but I don't think so. Also, the rest of my decor doesn't have much pattern to it (silk drapes, plain pillows, lots of cream and white and earthy wood). If you like the chevron, I think they go together well! It's a total statement piece. I know nothing of this stain blocker magic, but perhaps if I did our light colored items would look better one year in to parenthood. We bought a light covered couch and a light colored jute rug before our little one arrived and both have taken a beating. She didn't spit up excessively, but when she did it was over the rug. I also learned that baby drool leaves really incredible stains (we can get them out, but it takes work). Good luck choosing! I say go for the lighter one. Katie Bower has a white couch and it's about to survive her second baby. I know you have dogs and all, but I think you could totally do it. I do love the chevron, though. :) Good luck!